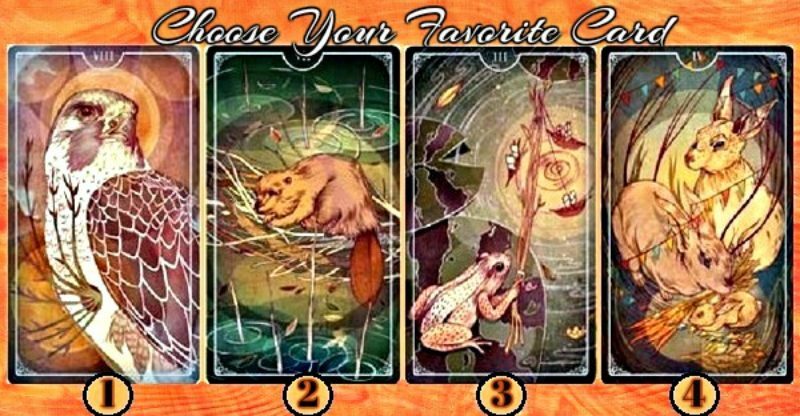 Choose your favorite card from the forest spirits, and please don’t choose just for the sake of choosing. Listen to that voice that tells you which card to choose, because right in that card there is a message for your life. If you already chose, all that’s left is to discover the wonderful message it sends you. This card comes in your life to tell you that wonderful thing are about to happen. You probably have many questions: what to do, what decision to make, where to go. And although sometimes you lose your temper (and even faith and patience) the important thing is to understand that one day, very soon, everything will make sense, that everything that must happen will happen, naturally, at the right time and for the best reasons. Every situation you experience has a purpose in your life. For this reason, stay patient, fill yourself with optimism, work every day with love and continue advancing along the path of your dreams. Very soon you will see how your great challenges of today become your greatest joys of tomorrow. No matter how many times you are knocked down, keep getting up, God sees your determination and will reward you when you need it the most. If you liked your message, do not forget to support us with a like and share the result with your friends and family. This card comes in your life to remind you that every situation that occurs and every situation you experience has a purpose in your life. The important thing is to stay strong, trusting that God always walks by your side. You are passing through the middle of a storm, but that does not mean you are not heading towards the sun. So today, with much love and much faith, open your arms, close your eyes, breathe deeply and say: I know that every event in my life is part of your plan, just give me your peace and help me flourish with the strength of your infinite love. Wonderful things will happen very soon. If you liked your message, do not forget to support us with a like and share the result with your friends and family. It is wonderful to have a beautiful mind that dreams, imagines, projects. But even more wonderful than dreaming is having the courage to turn your dreams into reality, because a dream without action is only an illusion. It’s time to stand up, analyze your possibilities and start taking steps to fulfill your desires. You should not run a marathon on your first day, the important thing is to start moving forward and every day keep moving forward, even if it is a single step, the most important thing is to never stop. If you had the ability to dream it, you surely have the ability to achieve it, a little more discipline and perseverance will make the difference. If you give your best, life will return it 10 times better, because God promises you that what you sow, that you reap. If you liked your message, do not forget to support us with a like and share the result with your friends and family. When you are committed to your dreams, God moves the universe to begin to conspire in your favor and in a wonderful and almost inexplicable way people, resources and situations start appearing to bring you closer to the place where you want to be. But it is not a superficial commitment, you must commit your body and soul with all that you have: take your time, always give the best of you even when nobody is watching you, be kind and trust in the goodness of life. You are the architect of your dreams and the architect of your own destiny; commit yourself to your greatest desires and you will see how every day, at every moment, life gets on your side and God guides you along the path that will take you to your goal. If you liked your message, do not forget to support us with a like and share the result with your friends and family. 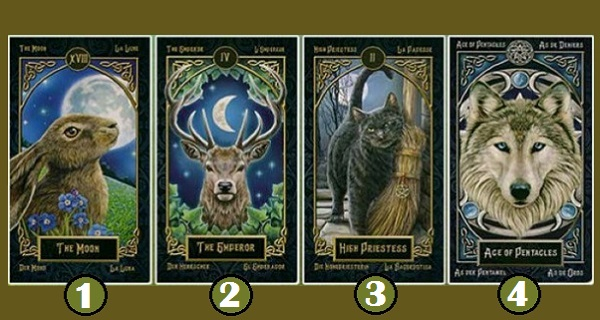 Which of the following animal cards caught your eye and jumps out to you? Every animal represents a type of personality. So, take a deep breath and have a good look at which animal resonates the most with you! 1. You are sensitive, compassionate, understanding and supportive. You are always thinking of others before yourself. You are the person others come to for help. Being needed motivates you but sometimes people take advantage of you. You are a gentle and free spirit. Your feelings run deep and you can be quite sensitive to hurtful comments from others, although you would never show it. You have a peaceful and tranquil quality and a quiet dignity about you. People are drawn to your charismatic and alluring energy. You are usually introverted rather than extroverted and may give the impression of being shy; although this is not the case. You are creative and like to be individual in most of your endeavors, including your dress and home decoration. You love the unconventional. You are idealistic, and often impractical, with a great imagination; often dreaming of a future in an ideal fantasy world where you exclude the ugly side of reality. You tend to look at life through rose-colored glasses. People who don’t understand you sometimes think you are eccentric because you spend so much time in your fantasy world. 2. You are warm, optimistic, extroverted and often flamboyant. You are friendly, good-natured and generally an agreeable person. You are assertive and determined rather than aggressive. That’s because you are too light-hearted for that. You thrive on human social contact and social gatherings, bringing all types together. When the mood strikes you enjoy partying, socializing and planning all types of social events. You are often the loudest talker in a group. While you are charming and sociable you do tend to be a bit of a show-off. You get great satisfaction from helping others and they find you inspiring with your vitality and positive energy. You are tolerant and accepting of others just the way they are. You are a people person, motivated by what others may or may not think and always trying to keep up with the Jones’. You need people around you – being alone for too long makes you depressed and you then allow negativity to engulf you. 3. You are moderately conservative, reliable and trustworthy. You are quite trusting of others although you are very wary in the beginning until you are sure of the other person. At the same time, you also have a deep need to be trusted. You are not impulsive or spontaneous. You always think before you act and do everything at your own pace, in your own time. You take time to process and share your feelings. You are genuine and sincere, and you take your responsibilities seriously. You are fairly even-tempered unless your emotions take over. Then you can become either moody and over-emotional, or cool and indifferent. You are sensitive to the needs of others and caring with your close circle of friends. While you are friendly and sociable, you prefer the company of your own close group of friends. You need to have direction and order in your living and work spaces – untidiness and unpredictability overwhelm you. 4. You are independent, strong-willed and determined. Prestige and power are important to you and like to be in control of yourself and situations. You are non-emotional and give the appearance of a dignified and sophisticated person who is in total control. This is often a front as you may feel quite insecure in the company of sophisticated and cultured VIPs and upper-class people. You like to keep people at a distance – guarding your emotions and creating an impenetrable barrier between yourself and others. You may be looking for protection from the negativity that surrounds you. You sometimes try to create an aura of mystery and intrigue around yourself to keep people curious. You may be going through a stage of self-denial right now, not allowing pleasure and joy into your life. You hold things inside and are not good at sharing yourself with others out of fear of judgment. You are methodical in your work, making sure everything is completed as required, down to the last detail. If you like this post share it with your friends and family. Although it may seem surprising, with only a picture, a card or a drawing … you can define aspects of your life and your personality, that you did not expect to have. Look carefully at the 4 cards and choose the one that appeals the most to you. Next, discover its meaning and how it is represented in your life. You characterize yourself as a curious, very analytical and observant person. One of your main pursuits in life is freedom and many times you may feel overwhelmed by commitments or situations that limit your ability to decide where you want to go or what you want to do. Your mind is very active and can process many ideas simultaneously. Because of that, you are a very impulsive person, who has a hard time finishing his obligations on time and is constantly changing his plans. Your main challenge is to silence your mind and better organize the way you spend your time. Remember that it’s better to work on a single task at a time than to take on many tasks at the same time because when you focus on something, you invest all your talent, concentration and energy to achieve great results. You are a naturally talented person and with a little more organization you can continue to reap triumphs and achieve wonderful things in your life. If you liked your description, don’t forget to support us with a like and share your result with your friends and family. You are characterized for being a detail oriented, sensitive, spiritual, creative person, with great aesthetic sense and with a great talent for areas that require some form of art or manual creation, such as painting, making music, design, etc. People like you enjoy building a unique personal style because they want to feel different and special. It is likely that your world and your personal space are full of color, accessories and innovative items. It is very likely that due to your emotionality you constantly change your mood and it is very important that you accept this situation so that your moodiness does not control your life and your relationships but that you control your moodiness. Remember that beyond the circumstances, the difference between happiness and sadness is determined by your attitude, so remember every day that you are a naturally happy person, who with your creativity and energy can achieve wonderful things every time you want it. If you liked your description, do not forget to support us with a like and share this test with your friends and family. You characterize yourself for being a sociable, fun, very energetic and intense person, whose essential nature is to be happy. It’s likely that sometimes things happen that sadden you, but over time you have managed to understand that with optimism and perseverance you are able to resolve any situation that occurs in your life. By your way of life, you can’t stand the monotony and you need situations that challenge you and your desire to get ahead all the time. Because of the intensity with which you assume your life, you are likely to remain very active and rest very little (or even sleep at night). At night try to set a few hours in which you will eliminate all distraction from your life (computer, phone, TV, etc) and allow yourself to have a good restful night. This way your work, your state of mind and your results will improve remarkably with each passing day! If you liked your description, do not forget to support us with a like and share this article with your friends and family. You characterize yourself as a noble, generous, very kind person with a sincere love for others. You constantly dream of an ideal world, with justice and well-being for all and for this reason it’s common for you to commit to charitable causes or to support the poor and other people who need your help as much as you can to the best of your abilities. Your commitment to your family and the people you love most is absolute and you are definitely a person they can trust. As you are trustworthy, you want to trust others and when someone disappoints you, that person will have a hard time to regain your trust. One of your main challenges is to learn to say no because many times you agree to do things just to please others. Remember that helping and doing good deeds should be a joy, not an obligation. Understanding this will help you avoid being used by other people and make your life more joyful and happier. If you liked your description, do not forget to support us with a like and share this post with your friends and family. Our angels are always around us, guiding us and giving us divine protection. Sometimes we are not fully aware of their presence, but that doesn’t mean we can’t tune ourselves into their message if we try. Below is a series of four celestial symbols, each used with a specific purpose for the angelic realm. 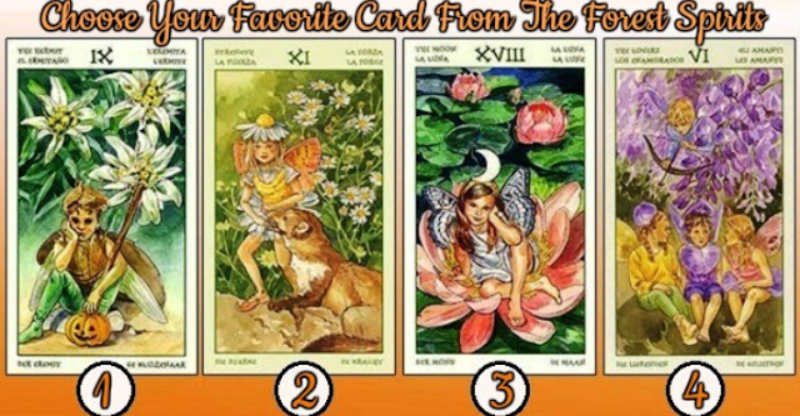 Look at them carefully and choose the one you feel most attracted to, or resonate the best with. 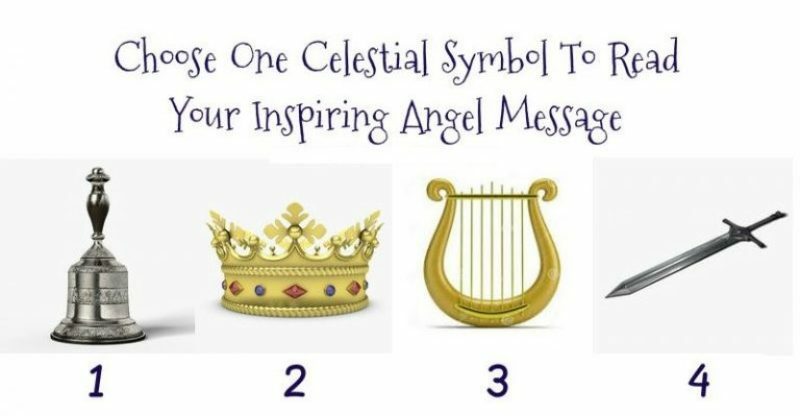 Then, scroll down to see what your angelic message is- remember it’s okay if you feel drawn to more than one. Sometimes we need more than one message! You were inspired to pick the bell. As an angel symbol, it means you are going through an ‘awakening’. Bells have been used throughout time in religious services and celebrations. The sound of the bell clears stagnant energy and speeds the arrival of new opportunities, new people, new interests, new ideas and good health. It’s like a personal spring cleaning! our body, mind, and spirit are being re-energized, embrace it. If you dream of a bell or it appears to you in meditation, your angel asks you to spring-clean some part of your life that is keeping you down. Once you do this, the doors to angel communication open beautifully. The block has been removed. Your angel is placing a crown on your head as a sign of congratulations. Perhaps you have been wise enough to count your blessings, despite your challenges. Angels love when you do this because it means you are becoming more spiritual (the ultimate aim for all of us). Only when you take this approach does life open and become truly amazing. It is no coincidence that the crown is placed on top of the head, the home of the crown chakra. This chakra point (energy center), is all about spiritual connections. If you dream of a crown or it appears in meditation, be very pleased! It means you are on the way to spectacular spiritual development. You were inspired to pick the harp. Harp music resonates on a special frequency and has a calming, healing effect. Your angel says a period of peace, acceptance, and happiness is approaching. If you’ve been feeling a little sad, or frustrated by life, your angel says relax and enjoy the time ahead. Feel the sun on your face, take joy in being alive. There is nothing else you need to do but embrace the peace coming to you. All will be well, the enlightenment you seek will follow. If you dream of a harp or it appears to you in meditation, your angel reminds you everything is about timing. Trust that there is a heavenly order and you must submit yourself to it. You were inspired to pick the sword. It is the symbol of Archangel Michael, the warrior angel. Because you picked this symbol it means you are consciously (or subconsciously) calling on this Archangel for help and protection. Know that He hears you, even if you have doubted your ability to contact angels. He is here to help you conquer personal demons (unhealthy habits, fear, negativity, and self-doubt). Perhaps you’ve even questioned if you’re special enough to be worthy of angelic attention? The answer is, YES you are! If you have the ability to be kind to just one person (or animal), then you are worthy of angelic attention. The main job of angels on Earth is to promote what is known as the ripple effect. Every tiny ripple you create a kindness you show triggers another ripple until eventually a wave is made. The Earth and humanity are at a critical time in history and it needs your ripples to survive. So now you can see just how important you are to angels!